Verne Gagne Wrestling is one of 6 games that were included in a grouping of games from the Gardner Company. All games came in the same box under the title of Big 6 Sports Games. This is a simple spin and find the results game. Also included in the box with this game was; Mickey Mantle’s Big League Baseball, All Star Football, Gardner’s Championship Golf, All Star Basketball and Gardner’s Stock Car Race. 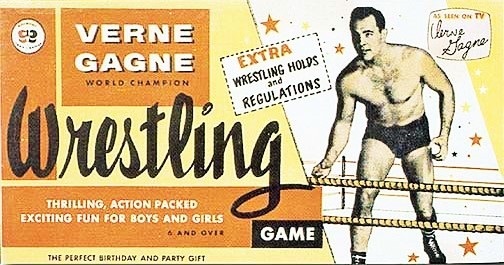 Released in 1956, Verne Gagne Wrestling is possibly the oldest wrestling game and one of the earliest examples of merchandising in pro wrestling. Today, the Gagne game is somewhat scarce; A copy with all of the pieces in good condition typically sells in the $75-100 range. ← KAYFABE THEATER: Rich & Gilbert receive the Tag Team of the Year Award… even though they hate each other!